Posted on Tue, Feb 7, 2012 : 1:18 p.m.
Guacamole is just one of the ways to enjoy avocados. The weeks surrounding the Super Bowl are among my favorites. It's not because I care tremendously about the outcome of the football game. No, I love the Super Bowl because avocados go on sale at grocery stores around the city before and after the big event, ostensibly to make them available to become a guacamole topping for the tons of nachos being consumed. 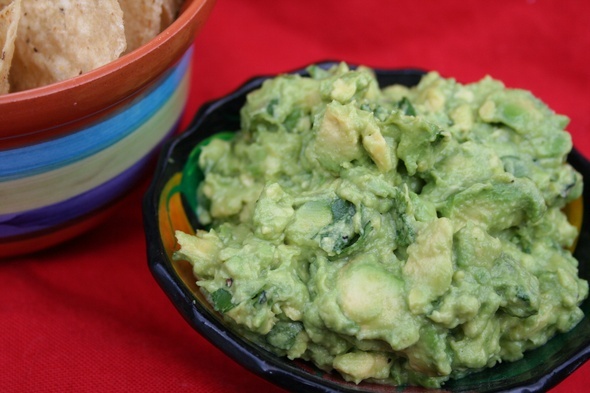 But beyond the ubiquitous guacamole, what do you do with all those cheap avocados? As it turns out, there are a ton of options. 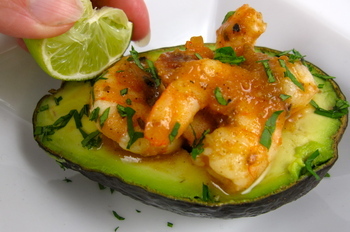 Peggy Lampman's recipe for avocado stuffed with cumin salsa shrimp. The food blog Serious Eats queried their staff writers to come up "Our Favorite Non-Guac Ways to Eat Avocados." The results are presented in a slide show. Everything from avocado milkshakes to fried avocado tacos are celebrated. There's also an interesting recent post on the Lifehacker site with a recipe for eggs baked in avocado. Here on the AnnArbor.com Food & Grocery page, we've been celebrating the many uses of the avocado for years. Try this warm avocado soup, avocado stuffed with cumin salsa shrimp or this ahi tuna and avocado salad. Mon, Aug 6, 2012 : 11:21 p.m. The Green Gazpacho dish from the South Beach Diet Supercharged is my favorite, in which an avocado is diced and is used as a garnish for the soup. The color goes well with the 2 tablespoons lime juice, 2 1/2 pounds zucchini (I always substitute zucchini for cucumber), 2 cups chopped red leaf lettuce, chopped green bell pepper and two green onions. The other ingredients aren't green. I prefer to eat the thick soup warm. It's a Phase One recipe, so anyone can try it right away; for those unfamiliar with the South Beach Diet, Phase One recipes are the only ones allowed for the first two weeks. No bread, no pasta, no fruit for those two weeks. Wed, Feb 8, 2012 : 2:21 p.m.
Avocado, romaine and tomato sandwich on hot, toasted whole grain bread dripping with butter. Even better with a slice of crispy bacon crumbled over the avocado. Quesadilla filled with grilled chicken, thinly sliced avocado, chunky salsa and lots of cheese. That recipe with the cumin salsa shrimp looks very good, too. Wed, Feb 8, 2012 : 12:07 p.m.
Tue, Feb 7, 2012 : 11:04 p.m.
1. As a side for any Mexican-style meal, simply peel, slice, lay out on plates in beautiful symmetry, and sprinkle with a little lime juice, cayenne and plain or garlic salt. 2. As above or plain, added to tacos as a garnish 3. As #1, accompanied by slices of jicama treated similarly. 4. Salad of avocado, orange and/or grapefruit with a sweetened orange-juice-oil dressing. Segment the citrus and present with pieces roughly the same size and arranged alternately. May be placed on Boston lettuce leaves as base. 5. Mash with a little lemon or lime juice, teaspoonful of minced onion, salt and dash cayenne or chili powder. Serve on toast with crisp bacon on top for breakfast or lunch. Tue, Feb 7, 2012 : 9:57 p.m. The avacodo milkshake sounds interesting. Are avacodos fattening? Wed, Feb 8, 2012 : 11:48 a.m.
Avocados ARE full of fat, but it's the good kind of fat. They're also chock full of fiber and lots of nutrients. If you stick to half an avocado a day, it should still fit into your overall calorie and fat allotment. Tue, Feb 7, 2012 : 7:39 p.m. I love avocado used as the spread (instead of mayo or mustard, etc.) on a sandwich.